Snack Girl happens to LOVE baked potato chips. My favorite brand, Cape Cod, managed to take out the fat without killing the taste. So, I was seriously thrilled to see that Tostito's scoops had come out in a "baked" variety so that the calories were reduced. Snack Girl has a bit of a history with Frito-Lay. After a Snack Girl guest criticized their marketing campaign see: What Everyone Needs to Know About Tostitos - Frito-Lay actually responded see: Frito-Lay Responds To Snack Girl. The package on the left is the Baked Tostitos and the package on the right is the regular Tostitos. What? 50% less fat means just a difference of TWENTY calories! Waaaah! I know that there are people out there who are going to buy this chip and feel good about their choice. Unfortunately, baking a Tostito doesn't magically change it into a healthy snack. For Weight Watchers members, there is a one point difference between the two chips (baked is 3 Points+ and regular is 4 Points+). But, I was hoping for a bigger difference. There is a taste difference between these two, and you can guess which one tastes a little bit like cardboard (baked). My view is it isn't worth the 20 calories to give up the tastier chip. Tostitos scoops are a treat that is best served with a healthy salsa. Honestly, 12 chips for 140 calories isn't that bad for a snack. But, most of us eat more than 12 (I am looking at myself in the mirror :). 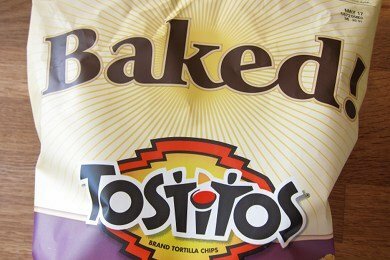 What do you think of Baked Tostitos? I can't even let myself buy a bag of chips, because I'll just sit there and eat the whole thing! Why are tortilla chips the ONE thing that doesn't come in a single-size serving package? I love tostitoes! Such a great snack with them and salsa... although sometimes I'm concerned about the amount of sodium I'm ingesting between the salsa and the tostitoes. I do find the scoops an odd shape to put in my mouth though, I prefer the dipping strips. Nice post, now I know to steer clear of the baked! Snack girl, you are amazing! Keep up the posts like this--so helpful to people who just don't understand the 'diet' food is not always best! 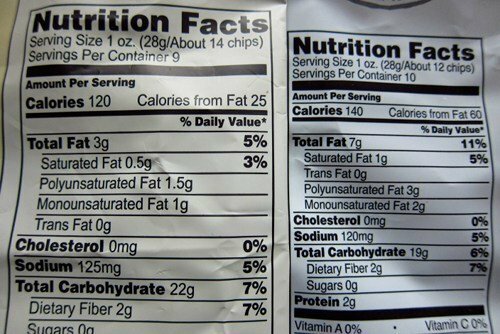 It's totally crazy that there is only a 20 calorie difference between the two especially when they lead you to believe that the baked chips are a healthier choice (and probably cost more for few chips). On the other hand you are saving 4 grams of fat. I'd rather save on the fat and not worry as much about the calories. With that said though - I only have these once every few months. Hi there, i stay away from chips of all kinds (not wanting to ofcourse) but when i am really wanting them or a crunchie snack i take pita bread, open it up and cut it into thin strips and toast them in the oven till crispy then i dip them in salsa..It is so satisfying!!! Sometimes ill sprinkle a lil salt on them to get that chip effect...Try these and enjoy!!! Thanks for the tip Donna, I will have to try that! Less fat, sure, but more sodium (with the recommended # coming down - every mg counts!) & yes, I agree with the cardboard comparison. It took a while to get used to the different taste/texture of the potato chips but these taste even "flatter" to me, if you know what I mean. Personally, I'd rather stick with the regular ones for salsa or make my own. I especially like to make ones dusted with cinnamon to serve with fruit salsa. And there are more carbs in the baked version! WTH? I love the NEW WHOLE GRAIN Scoops....extra crunchy sides...I put corn and black beans salsa in them. 12 for 140 cal. But you can scope so much more in them...the healthy salsa's :O) Not the cheese dip! The same occurs with yogurts. The 'diet' yogurts are often higher in sugar because they've removed the fat. I guess something needs to compensate when they take out an ingredients that gives flavour (fat, sugar, msg). I just wish people would read labels more because there are A LOT of people thinking they are doing a great thing for their health when in reality they are only switching one (so called and much adored by me, of course) evil for another. I too bake pita chips. I also brush some olive oil on tortillas and bake those as well. For a little kick, I sometimes add some cayenne or chili powder or paprika. For sweetness, I dust with a bit of cinnamon sugar. It's not only less fattening, it's also good for your wallet! The difference in the calories is due to the breakdown of the fat, carb and protein grams. 1 g prot/carb = 4 calories. You save 4 g fat (36 calories) but it's offset by 3 g carbs (12 calories) can't see protein but I bet that is the balance. The real tradeoff I think is more than just calories because if you have to restrict your fat (people with no gall bladder or heart disease) then sometimes it makes sense. For me is a personal preference. If I am using them for my nachos where you don't necessarily taste the chip alone, then, I save the points+ and calories. If I am having chips and salsa, I almost always go for the real deal or make my own because I want to taste the chip flavor. For those of us who are counting carbs, 3 more carbs for the "low fat" version is a lot. So I agree with Snack Girl! 20 calories is a drop in the bucket. Look at the fat this way 20% of the calories from fat as opposed to 42% of the calories from fat. Sodium difference is insignificant especially for a packaged snack. What would really make this snack a lot healthier is if it was made with whole corn. Does anyone have the ingredient list in order to find out? It's not just about calories. How do you feel after you eat baked or fried? And how satisfying is each? Some people get an upset stomach from fried foods... I know sometimes restaurant chips and salsa will do that to me--but other chips won't. On the other hand, fat provides some satiety. When the low fat craze was the rage I would have to eat every two hours because my blood sugar was volatile without fat to keep the food digesting more slowly and emptying out of the stomach at a fast pace. Let me give you an example. Sara Lee makes a bread called "45 calories and delightful." It's low in calories, 90 calories for all the bread in a sandwich. BUT it's "fluffy" and less dense than those little sandwich thins--and it only has a couple grams of fiber per piece of bread. Thank you. I have purchased these thinking I was making a good choice. I never thought to compare them. You totally rock! My school sells these and sometimes even makes chili (I'm not even sure if it's homemade or not...) and gives these to the students to eat for lunch. Totally unhealthy!! Just because a chip is baked, it sometimes does NOTHING. Anybody notice the sodium content is actually higher in the baked?? 125 vs 120 ... wha??? How?? Why?? Unfortunately, I am one of those people that must restrict fat for health reasons. I looked at two stores yesterday & they were both out of baked Tostitos. I hope they haven't stopped making them!